“SAVO” By Richard F. Newcomb. Summer, 1942, the tide in the Pacific was just starting to turn in the favor of the Allies. In June, the American’s had defeated the Japanese at Midway. The Marines had just pulled off fantastically successful landings at Tulagi and Guadalcanal. Then on the night of August 8 – 9, 1942, a fleet of American warships suddenly came face-to-face with the Imperial Japanese Navy. The bloody Battle of Savo Island, was the first major naval engagement of the Guadalcanal campaign and the first of several naval surface battles that took place in the straits later known as Ironbottom Sound. The enemy force of fast cruisers sent out scout floatplanes that reported the American forces. Both radar picket ships (radar range about 10 miles) were at the extreme ends of their patrols sailing away from the Japanese fleet. The enemy was lost in the visual and radar shadow of nearby Savo Island. Allied ships were faintly silhouetted by a freighter burning far over the horizon. The Japanese discovered the southern force and fired torpedoes before they were detected. Simultaneously with the explosions, the scout plane dropped flares illuminating the allied fleet. The cruiser HMS Canberra was stuck by two torpedoes and heavy shelling. The US ships fired star shells and opened fire. USS Chicago of the southern force was torpedoed. The two Japanese columns passed on each side of the US force and opened fire on USS Astoria, USS Quincy, and USS Vincennes. The American captains mistakenly ordered a “cease fire” assuming they were Americans firing on their own ships. In just 32 minutes the Japanese had inflicted massive damage. Four American heavy cruisers were sunk and a heavy cruiser and destroyer badly damaged. 1,270 men were killed and 708 injured. The enemy had comparative scratches on three cruisers. 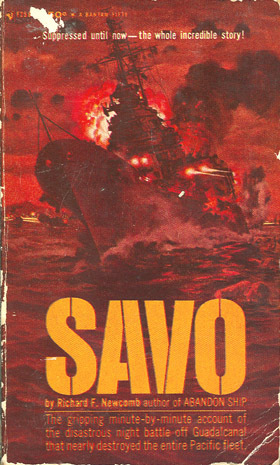 Here in “SAVO’ is the gripping minute-by-minute account of the disastrous night off Guadalcanal that nearly destroyed the entire American Pacific fleet. 1963 Paperback edition. 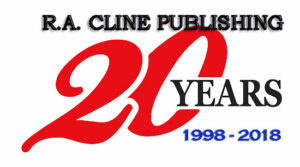 200 pages, 2 maps, large appendix and an index. No photos.